Digital painting tutorial Dead Space 2. Here is a digital painting video and step by step tutorial inspired by playing Dead Space 2. This video shows you how to draw then color a character from Dead Space series. You will learn how to paint Isaac in his mech armor suit and a creature. This one is a bit old, you can click on the labelled buttons below the video to see a more recent similar style character coloring video. You can scroll down further to see step by step images with instruction. I was playing in for a while and I love it. Dead Space 2 is a survival horror third-person shooter. Though it is very spooky and creepy. A lot of interesting scary creatures or humanoids called “necromorphs.” I really like the main armor designs, there are many cool armors in this game. As this blog progress, I am trying to make the painting a little more cinematic or storyboard frame like rather than character pin ups. I think the format fits speed painting best. Also I get to push myself further and further by challenging myself to find good composition and define lighting in the scene. So if you are looking for basic drawing or painting tutorial, please look at the thumbnails above the blog or the right column. If you scroll down the menu on the right column, you will find most of the basic and all the tutorials there. And once in a blue moon, I will make a basic drawing tutorial, photoshop tips and tricks for painting and some art article that I find interesting. Most of my step by step are very similar, only sometimes I will start of using just shapes. I usually scribble or draw it out first in the most basic form. Then I will paint a flat value onto the drawing to create a cool and clean silhouette. After that I will refine the shape and the surrounding more by using value and edges. 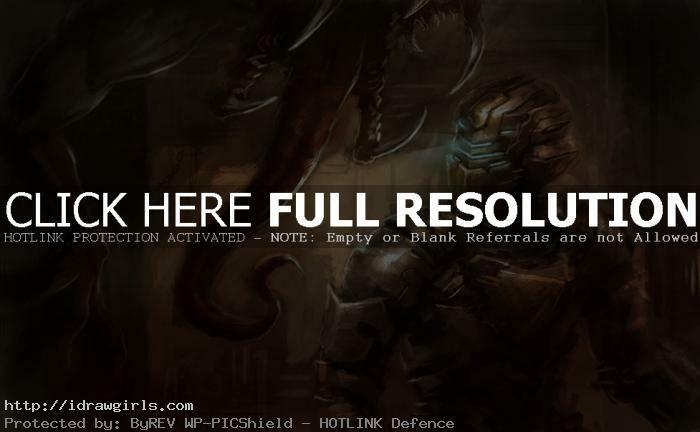 Watch video digital painting tutorial Dead Space 2 Isaac. Below are step by step how to paint Isaac from Dead Space 2. I tried to appreciate all the visual wonder that the game shown by going through every arena. Some of the places are a little dull and can experience very encased, but it isn’t too bad.